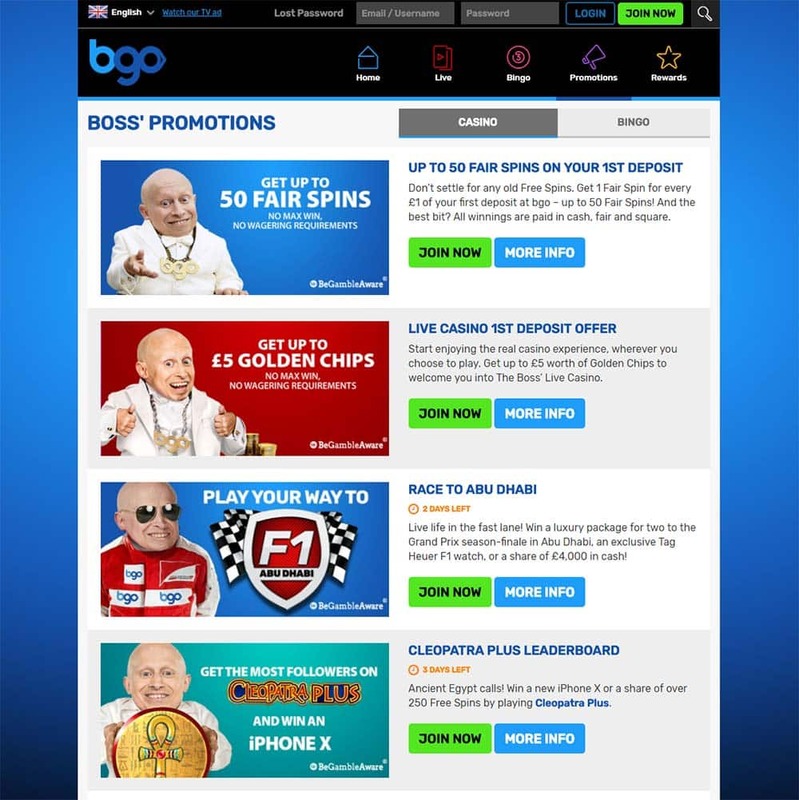 BGO Casino Review – up to 50 Fair Spins with no wager requirements on offer! BGO Casino has today been added to our growing list of recommended online casinos for you to play at, launched in 2012, BGO Casino has grown steadily and not only has a massive range of online slots and games but also offer new players a unique offer of up to 50 Fair Spins with no wager requirements that can be played on a variety of online slots that include Starburst, Hansel & Gretel, Aloha Cluster Pays, and Shangri-la Cluster Pays. BGO hold a valid gambling license with the Alderney Gambling Control Commission and of course the UKGC (UK Gambling Commission License) and as such welcome players from the UK along with many other countries. 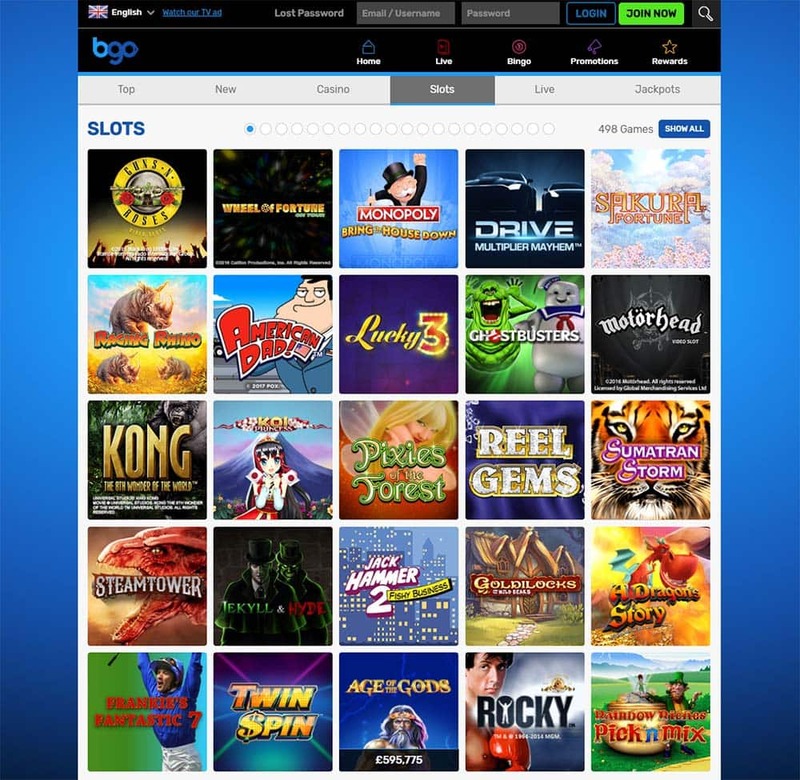 BGO Casino has such a wide range of different games and slots with close to 500 different slots on offer to play, the other games have been split up into various sections, so it’s definitely worth a few minutes exploring through the menus to find your favourite table games, bingo or slot machines. The new welcome offer basically offers you 1 fair spin for every £1 deposited on your first deposit at the casino up to a maximum of 50 fair spins, the reason these are being called fair spins is that have absolutely no wagering requirements tied to them, there’s a minimum deposit of £10 required in order to trigger the fair spins and of course a first deposit of £50 will grant you the maximum welcome offer of 50 fair spins. BGO Casino – Up to 50 Fair Spins with no wagering requirements! Fair Spins can only be used on Starburst, Hansel & Gretel, Aloha Cluster Pays, and Shangri-la Cluster Pays. The welcome package at BGO is not available to players that are depositing using either Neteller or Skrill as a payment method. 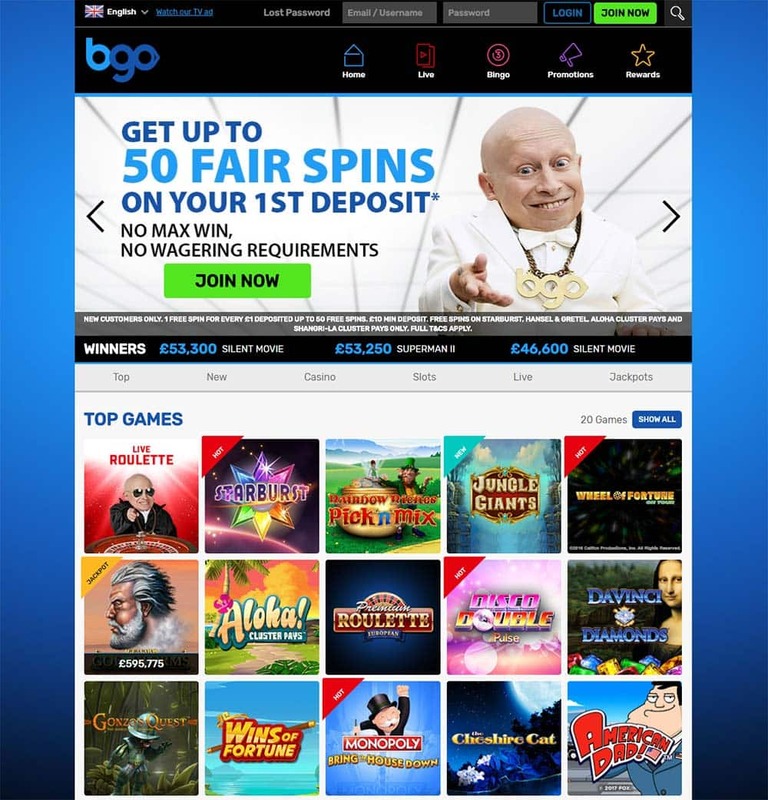 BGO Casino has recently refreshed their casino design and you will now find all of the slots in 1 single section with close to 500 different titles on offer, alongside this they also have separate sections for the Live Casino, Bingo, Promotions and Loyalty sections making it very easy to navigate. With big name developers like Playtech, NetEnt, Quickspin, IGT, WMS, Nextgen all on offer, along with a whole host of table games, live casino and several other bingo games on offer along with regular casino promotions on offer to players. BGO Casino has a large range of deposit and withdrawal methods on offer which includes Visa, Master Card, Paypal, Neteller, Skrill, and Paysafe Card along with several more. It’s worth noting though that you are currently unable to claim the welcome fair spins if making deposits with Neteller or Skrill. Customer support is primarily from the live chat with help on hand from 8.30am till midnight every day, there is also a comprehensive FAQ section and email and telephone options available too. If you need to send your documents in for KYC(Know Your Customer ) checks then there is a handy form that you can attach your documents to. In short, if you run into any issues check the “help” section for assistance. BGO Casino offers players an interesting welcome bonus offer in the form of their 50 fair spins that come with no wagering requirements, removing a lot of the confusion and hassle of having to keep track of all the regular bonus terms and conditions. With a great selection of slots and games to choose from, there is plenty of choice on offer with the most current releases being added in a timely manner to the casino. Promotions-wise there always seems to be something good happening throughout the casino so make sure to check your personalised email offers and of course, the promotions section and loyalty store once registered.